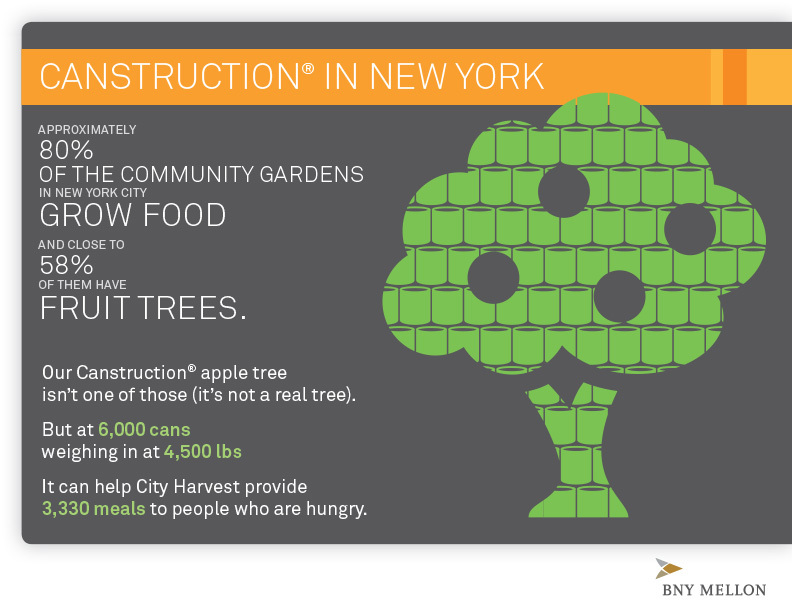 BNY Mellon, in partnership with Canstruction, Inc., invites the media to attend the building of a giant apple tree made up of more than 6,000 cans of food. All food items used to build the tree will be donated to City Harvest on October 31 and will provide more than 4,500 pounds of food, creating more than 3,300 meals for local residents. More than 850 million people in the world don’t have enough to eat, and one of every eight people suffer from hunger. A staggering amount of food is lost or wasted at almost every point in the food chain, and no country or region is immune. BNY Mellon has launched a global initiative to raise awareness of issues related to food security and waste. BNY Mellon will be partnering with Canstruction® to build giant structures out of canned food in five of its largest cities. The apple tree in New York will be joined by structures in Boston (apple), Hong Kong (rice bowl), London (fish) and Pittsburgh (globe) – each one chosen to spotlight a different issue related to food insecurity. The structures together will be built from approximately 17,000 cans of food that will be donated to local food banks. BNY Mellon expects the structures to contribute more than six tons of food and help its community partners provide more than 9,000 meals. BNY Mellon employees will be assembling the structure and will be joined throughout the day by senior leaders in the company, including Curtis Arledge, Vice Chairman and CEO of Investment Management, and Brian Shea, Chairman of Pershing LLC and President of Investment Services. Building will begin at 8:30 a.m. and last until 4:30 p.m. The structure will remain on display until Thursday, October 31.